Since I am new to Guitars I have not been following the sales cycles. Seems a lot of dealers are closing out some at discount. Is this normal timing after NAMM and the 2019 model release? Since I need to stretch the buying power the best I can good timing is of great interest. Is this a good time to look for a buy? 1) Find used on classified, Reverb, eBay, etc. Most of my guitars are all used purchases. I fix them up a bit and they play excellent. 2) Sign up for Guitar Center or the like mailing list and they can offer 15% off coupons and such. I use these to get a match at the local store near me, but that may not be an option for you. Anyhow good luck, just be patient and you'll find a very nice guitar out there. Well 2019 is going too be a very odd year and if what the new boss CJ says is true then its going to change some what from this year. For the last how ever many years Gibson has been doing the yearly release model.. I always thought this was a bit odd for a guitar company to do as what happens is everyone knows that all you need to do to save a few bucks is to wait till the new ones come out that year (which was happening around October)and the previous models start going cheap. If you didn't know Gibson filed for bankruptcy in 2018. Since then they now have new management and they have decided to ditch the yearly model. So whats available from some time this year will always be available. So in 2019 we have had two line ups.. The Henry models (the previous boss) and from now the new CJ models. So now is probably a good time to buy an older discounted model before all that yearly stuff stops... If you see what I mean. If you are interested.. Heres the new boss. Personally I really like what he is saying.. Now we just have to wait and see what he actually does this next coming year or so. I got the impression that half the line won't be dated per say (the classic and vintage models), and the other half will have different mods, designs, and such from year to year. I still think the dates of production will be known via the serial number. If not, collecting won't be the same and they won't get the repeat sales they enjoy now. Well yes, of course they will still have serial numbers and probably Made In XXXX. The difference will be that the line wont change. It will be the same line up every year with some special runs or Ltd Editions..
Of course, if they stick to this and if it works, only time will tell. I think it also depends on how they treat the shops from now on too.. Gibson over like the last decade or so have been phasing out smaller dealers leaving only a few of the largest chains able to sell Gibsons at all.. From what I understand a shop has to order like a hundred thousand pounds/dollars worth AND Gibson tell them what to stock. If they started supplying smaller outlets by maybe having a sliding scale depending on the size of the outlet, they will sell more guitars. It seems simple enough? Get them in to more shops, sell more? I got bit by the Guitar bug last summer. I bought a unusable Strat off Craig's list and taught myself how to fix it and then setup. I wish my playing skills had advanced as quick as my Luthier skills. But its more natural for me to work on things.I have since bought similar distressed low end Epiphone's with stripped neck screw holes etc. While this has worked well for me I have been yearning for a higher quality non damaged or distressed Axe to grind on. I had a falling out at Guitar Center and their business model early on. I ordered a ship to store Epiphone Les Paul and went to pick it up. It arrived in a ball of shipping airpack with no original packing. I would not accept it at full retail since in my mind it was a display model and I expected new in the box. That is how it works in any other business. No paperwork not even a Truss wrench. It may be their business model to sell that way but I found it unethical. If its without any original packaging and no warranty information how is that "new"? It probably came off the wall of another Guitar Center somewhere.I left it with them. One of the employees told me they throw all the boxes away. I guess all the truss wrenches or other accessories get tossed as well. As a general rule, Black Friday is a very good day to buy. Often the standard "15% off any one item" you commonly see will exclude Fender, Gibson, and many other desirable makes. But on BF, the exclusions are lifted and often slashed up 20%+. This being February right now, that may not help you, but just keep that in mind later. Also keep an eye on "clearance models", especially from previous years -- you can find some amazing savings sometimes there. 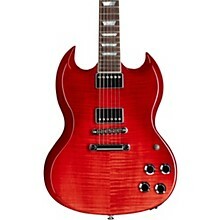 Here is an example: A brand new Gibson SG HP (2019) costs $2500 from Guitar Center, while they have on clearance 2018 SG HP models for just $1600 with different color choices. Back to the OP. Yes, unfortunately, many makers are trying to emulate the (godawful) automobile industry by making model year changes, and limited editions, special runs, etc., so that they can goad/force the consumer to buy something either to stay current or because they think it's special. To me, this is all nonsense. It does translate into closeouts, etc., once a model year is ending and the undesirable guitars remain. I never think of these as savings, or even good deals -- it's just that the final price is closer to what the guitar was really worth. If it were worth more, someone would have paid more. I buy used, not because I have to, but because there is a vastly greater selection of used guitars, and it is generally easy for me to identify which used ones are the great ones because they've had time to settle in physically, and become stable. I have bought new, but rarely. I usually find that all the NAMM specials, year-end closeouts, and GC specials are not guitars I want, and not worth more than the discount/sale/special price... which is really just the going price. To me, it's all about homework and patience. ...To me, it's all about homework and patience. Yes, homework and patience is key in finding a guitar when you are serious about playing. Usually after Winter NAMM is a great time as all the new models are coming out & it's time to blowout the old inventories. Black Friday has good Sales too. MF & GC send out 15-20% off coupons periodically.